One of the name’s used to describe God is Jehovah Shammah which when translated is “The God who is there”. In today’s study we see to miraculous events among those who believe – the woman who touched his cloak and those from the house of Jarius. Despair had struck them both but faith in Jesus delivered them in an instant. Yes, the purposes and power of God reach far beyond what we can grasp or imagine. 22 But Jesus, turning around and seeing her, said, “Daughter, cheer up! Your faith5 has made you well.” And the woman was made well from that hour. 44 came behind him, and touched the fringe of his cloak.12 Immediately the flow of her blood stopped. From this passage, what should learn about our response to our emotions and situations of life? Do you think you are aware of your surroundings, as Jesus was, and the need of those around you? Are miraculous healing possible today? (The answer is yes.) What then does it take to be healed? What is it that you desire the Lord to do in your life today (this week, this month, this year)? 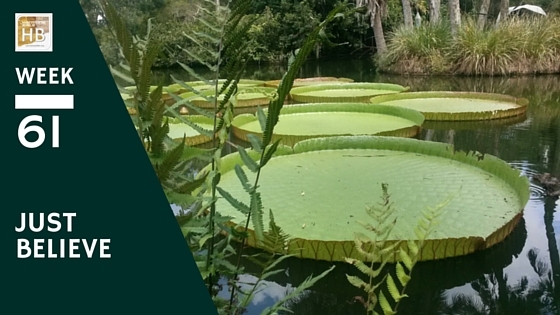 Photo: Victoria lily pads at Bok Tower Gardens, FL These water lilies are almost unbelievable – 5-9 feet in diameter and strong enough to hold up 150lbs. Only Matthew reports that Jairus (a ruler) came to Jesus. Matthew recorded that Jarius came to Jesus after his daughter had already died. However if we look at the Greek we’ll see that the authors used three different word pairs for dead. Matthew uses the term “is even now dead“, Mark uses the phrase “at the point of death“, and Luke says that she “was dying“. So it seems that she was only near death – but that she would surely be dead by the time Jesus could arrive at his home. If it was Matthew rather than Luke the physician who reported that the girl was about 12 one could consider it a literary tool to help people remember this remarkable day, but it seems that the older woman, an outcast due to her illness, was healed within the same hour as the young girl who was the daughter of a devoutly religious ruler. It is understood that Jesus has returned to Capernaum with his disciples. He had been there just two days before (see Section 61-66) when after healing a demon-possessed man who was blind and mute the Pharisees thought Jesus to be “of the devil” a then he began to teach the crowds in parables and explain them to his disciples. The day in between, Jesus had crossed the Sea of Galilee at night in the boat with his disciples. He calmed the storm and in the morning he delivered two demon possessed men. No wonder word was spreading so quickly. The psalmist says waiting requires strength & courage (Ps 31:24). Paul writes in Rom 4:18-24 a similar faith in heart of Abraham who “In hope he believed against hope… fully convinced that God was able to do what he had promised”. It was the morning after that big storm. Perhaps some fishermen were already along the shore attending to their boats, and the townspeople were milling around in the streets, but as it was announced that Jesus had returned the crowds gathered – eager, curious, expectant. Jairus one of the elders of the synagogue, and was presumably a wealthy man of class and distinction. But neither his pedigree, position or possessions seemed enough to deliver his dear daughter from death. His coming to Jesus indicates not only his love for his daughter, and the reputation which Jesus had earned as a holy man and healer, but also required some amount of humility and courage as his peers (and perhaps he himself) had already come at odds with Jesus (see Section 61,62). According to the first hand reports that Luke heard, there were so many people that he used the Greek word sympnigo which is akin to being suffocated. Also used in the parable of the seed (Lk 8:14). Faith is in the object of faith, that is in Jesus.